Continuity is sometimes the most elusive aspect of any long running story, especially where multiple seasons, new storylines and characters, and real world breaks of several years are involved. Thankfully the studios behind the majority of anime titles try not to make more work for themselves (although some do take this ethos to the extreme - you know who you are), and these days the majority of shows that run for more than one season tend to have an average gap of about one year between each series.. If ever there was a truth in anime though, it's that you can always rely on Lina Inverse and her gang (including everyone involved with the making of anything to do with Slayers), to complicate matters. 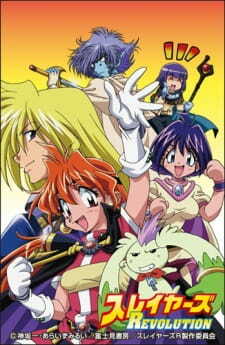 Having had a rest period of seven years following the end of Slayers Premium (the fifth movie), anime's flagship fantasy comedy roared back into life in 2008 with the release of Slayers Revolution, and to the legions of fans around the world the news that a new series of medieval mischief making was on the horizon was met with huge amounts of expectation. The only question was, could the franchise go toe-to-toe with the post millennium big guns. The first thing that one can say about the story is that it is Slayers through and through. The plot is pretty straight forward for the most part, although there are a few detours over the course of the 13 episodes. The storyline is predictable in a number of areas, and the somewhat simplistic approach to storytelling can sometimes be a little childish. Probably the biggest criticism though, is that the formula used for both the plot and storyline is relatively unchanged from that used in the first three series. During the seven year absence of Lina and her friends the medium of anime has become more mature in many aspects, and given this fact one has to question the reasoning behind using the old formula, even if it is tried and tested. That said, probably the biggest surprise is that there's still life in the method and approach adopted by director Watanabe Takashi, and it's his experience as the director of the original three seasons of Slayers that really shows in Revolution. The old tricks, plot devices and techniques used by the production team, especially the writers, are all on display, and while there are perfectly valid criticisms that can be levelled at the series, fans of the franchise will find the story not only understandable, but very, very familiar. It's not only the storyline that is pure Slayers. Everything from the characters to the scenery follow the designs from the original three series, and while Revolution may not look as appealing as many modern shows, what it lacks in style it more than makes up for in attention to detail. Now some may consider the design principle in Slayers to be dated, and to be honest, it is. It should be noted though, that while Revolution is open to new viewers of the franchise, it's not actually geared towards them. Slayers has always resisted the common urge to reinvent itself in order to appeal to a younger audience, and it's this dedication to the spirit and ethos of the franchise that really stands out with Revolution, especially after a gap of so many years. The big plus for fans is that while the overall look of the show is exactly what one would expect from Slayers, the character designs are ever so subtly sharper and more detailed. In addition to this the series really benefits from the use of modern animation techniques, and it's to the credit of J.C. staff that they continue to maintain the standards they set in the first three series. The other major bonus for fans is that the gang really are all here. Any fan of Slayers will immediately recognise the seiyuu in the roles of Lina, Gourry, Amelia, Zelgadis, and even Xellos and Sylphie. The production team have spared no effort in their attempts to maintain continuity, even going so far as to have the same actors and actresses reprise their roles from the original three series. It's this attention to detail that sets Slayers apart from most other shows, especially as the franchise could very easily have gone down the path of Sakura Taisen (i.e. each series had a different studio, cast and director). The music is a bit strange though, but not in a bad way. There are some very good pieces that are suitably over the top when necessary, and many of the other tracks are well chosen, although the timing is sometimes a little off in certain scenes. The OP is a fairly typical beats-per-minute dance track by Hayashibara Megumi (the actress who plays Lina Inverse), called "Plenty of Grit" that seems a bit of an odd choice for the beginning of a fantasy anime. The ED, "Revolution", is your common or garden J-Pop song that is also by the same artist. The weird thing is that both tracks seem to work, but also seem a little out of place where the franchise is concerned. Moving on, one of the things that has long been a hallmark of Slayers are the strong characterisations associated with each of the lead roles, and Revolution is no exception to this. Unfortunately, because this is only a 13 episode series there's not as much room for the characters to breathe and grow, especially when the show detours from the main storyline for one reason or another. The upside though, is that the characters are exactly what those familiar with the franchise would expect. Lina is still as bad tempered as ever, Gourry is still as dumb as a brick, Zelgadis continues to be the cleverest member of the gang, and Amelia remains a justice freak. The new characters are a pretty mixed bunch, with Pokota leading the field when it comes to weird. Probably the most interesting addition is Wizer Freion, who at first appears to be a typical bumbling detective, but may or may not be almost as smart as Xellos - the series is never quite clear on that point. As I said before, Slayers Revolution is mainly geared towards fans of the franchise, and as a card carrying member it's pretty obvious that I'd have high expectations of the series, and I wasn't disappointed ... much. The series is fun, sometimes inventive and original (Pokota, for example), and as action packed and humourous as the original three seasons, but there's something ... not quite right about it. Prior to the seven year break Lina, as a character, had a degree of charm about her that prevented her from becoming annoying. The problem is that Watanabe tries to apply some of anime's current maturity to Revolution's characters, and the results are a bit of a mixed bag. Everyone is as goofy, charming, secretive, and downright bad tempered as ever, but there's an edge to them now that wasn't there before, and while it does give the viewer a new perspective on the characters, it also takes away a little bit of what made Slayers great in the first place. This series may not sit well with some people but the majority of fans might generally be pleased with this addition to the franchise. From the character designs and rather simple plot, to the combative relationships and over the top hi-jinks, Slayers Revolution does a surprisingly decent job of living up to the standards set by the first three seasons. While it may have lost a little something along the way, it may have also gained something as rather than changing everything about the show in one fell swoop, it looks as though Watanabe and J.C. Staff are taking a more subtle approach to bringing the franchise into the 21st century. Story: Really poor compared to the story in Next and Try. It just gets way too predictable because none of the main characters do any training whatsoever so it's pretty much always the same spells. When will they learn that Fireball doesn't do anything to other magic users? The end is lame because of the cliche method used to win. If you read the series description, it says that Gourry needs a new sword, he doesn't really get one for keeps even though that was what they were doing in the first place. Along with filler, I give the story a 5. It just seemed very dry to me and it left a lot of things not taken care of. I have to give credit to episode 8 though. The fight was great and was the highlight of the series. Art: I gave a 10 because I loved seeing these characters animated in a clean and consistent way. Despite that the old animation is dated, it was nothing amazing even for its time so it was nice. Sound: Same cast doing the voices. I didn't mind that, no one should. It was great to hear Megumi Hayashibara doing voice acting again after such a long time. Ost didn't really stand out to me. The opening and ending songs were okay but to me, just not as good as the classic songs from the older Slayers series. In the previous Slayers series, Xellos would get weakened by positive statements. Say "The world is a happy place." and he'll kind of topple over and get weak. In episode 8 that I mentioned in the story section, Xellos fights Lina and friends (I know, awesome right?) but none of the characters thought to use positive thinking as a weapon. No, instead Lina and Zelgadis use Fireball... I guess after so many years the characters and writers have forgotten everything and threw continuity out the window. Now for the new guys. We have Pokota who is the Terriermon-looking thing who pretty much only argues with Lina. EVERYBODY argues with Lina so this was nothing new and it looks like Pokota's here to stay. He didn't stick to me either like Xellos did, as soon as I saw Xellos I knew he was good people. As for the villains, I didn't care for them. They even integrate Rezo back into the story which seemed lame to me. Enjoyment: Episode 8, that is all I needed to see. The rest was pretty hard to sit through. Had to force myself to finish it, it was a pain waiting each week for a new episode only to be sadly disappointed. I did not enjoy watching this series. Overall: They set us up for another season since a lot of the enemies need more development. One has a beef with Lina that went unexplained, one's name is Rezo spelled backward which has to mean something and one is now half horse and half tiger living in the forest. Trust me, those aren't really spoilers. I know I'll go and watch it despite my complaints if one comes out but I hope it's better than Revolution. I don't care that the averages of my scores don't add up to 6 but it's really that bad. Slayers Revolution is a show that isn't going to turn anyone who hates Slayers, but for Slayers fans it's a perfectly acceptable continuation of the series. I have watched Slayers from the beginning. I have the previous collections, and even some of the movies (god knows why). I have fond memories of watching it in high school, and although it's nowhere near the best show I've watched, I have a lot of fun with it. This new Slayers show is bound very closely to the ones that came before it (somewhat surprising since they were so long ago), so I have a hard time imagining what it would be like to someone who hadn't seen the previous series. I have to think that it would be very hard to get into. Slayers Revoltion is a bit mixed, at first. On the good side, the animation is higher quality, although new viewers will probably be turned off a bit by the character style, which, though a bit smoother, is pretty much the same as the old designs. The music is basically the same as before, and they managed to get the same VAs, so right from the start, the series feels like Slayers. A new character is added early on in the series: a little beast thing named Pokota. One of the first problems I have with Revolution is this character. His personality is to much like Lina's, and watching them fight gets old pretty quickly. Slayers has never been the most original series. Both Next and Try cribbed quite a bit off of the original, and Revolution is no exception. Especially in the first half, I felt like the series was just retreading old ground. This got much better during the second half, as did a lot of the problems, but I almost gave up before that point. The second half of the series is a lot better, and feels like it's going somewhere. In addition to the general acceleration of the pace, this part was structured differently than the usual Slayers seasons. Probably because the season was so short, there were a lot more plot episodes, and a lot less filler. Not that I don't enjoy Slayers filler, but it was an interesting deviation. In the end, this series was really just half a season. There were a lot of things set up that weren't resolved. A lot of the more interesting plot threads, in fact. Because of this, and because they've gotten some of the more annoying filler out of the way, I have high hopes for the next Slayers season, if they manage to get one out. As a huge fan of the original 3 series I was excited when a new series of slayers came out, although not too expectant since inevitably it was much more likely to be an amusing expansion to the franchise rather than a hugely epic series. Still I expected I’d get some giggles and nostalgia and that would be fine. Instead we got this hideous example of how to simultaneously milk your franchise while destroying it instead. It’s difficult to describe how sad this series made me after the ‘plot’ starts to take hold in the 3rd episode, and it only got worse until it finally hit rock bottom with the promise of going further downhill in time for the next series. There will be some mild spoilers in my ranting but nothing too serious. This series did occasionally have some slayers –like moments but the vast majority of it suffered from a seeming disconnect I wasn’t able to always look past. All the spells seem to have been converted from the previous series in bland CG which by itself is nothing to complain about but somehow they all seemed to render ugly and often have effects wildly different then how the pervious series handled them. Somehow I also feel like they somehow managed to derail Linas character but making her less egomaniacal and more homicidal maniac (one episode she apparently seems to be willfully trying to kill Amelia, a person she would probably have taken a bullet for in previous series). I’m not usually a person to notice or care about these things but this seriously bothered me while I was watching. The worst and most offensive part of this series is how it shamelessly steals it villains and plotlines from the original series, needlessly resurrecting perfectly resolved plot threads from 3 series ago. This is not only makes for heinously lazy story writing but also undermines events that happened way back in the original story. This is the sort of thing I expect from amateur fan fiction not a supposedly serious animated sequel. They even resurrected the rather badass eldritch abomination Zanaffer from the original series, gave him a completely needless origin story, and then reintroduced him as the kind of super villain character I would expect to get beaten up in an episode of captain planet, seriously who wrote this stuff and thought this was a good idea, and we haven’t even started on the new Rezo plotline. As if killing him twice in the original series wasn’t already enough they are apparently so stuck for ideas they felt the need to bring him back AGAIN 3 seasons later to facilitate their pathetic writing. So in summery this is series is disappointing garbage without much in it to make up for that fact. It’s not funny enough or well presented enough to make up for its atrocious plot which seems bent on destroying its own franchise. I can’t recommend this to anybody.